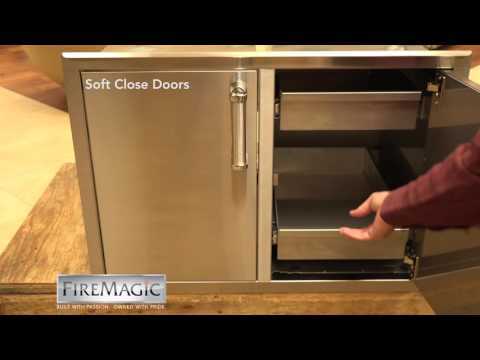 Complete your Fire Magic outdoor kitchen with their complete line of stainless doors and drawers. The Fire Magic Premium Flush Mount Stainless Single Access Door with Dual Drawers - Left Hinge features sealed double walled construction, foam insulated doors for a solid feel, and 304 stainless steel construction for lasting durability. Stainless steel mounts and a magnetic latch for secure closure are included. Door hinges and drawer slides come equipped with a soft close feature that not only prevents slamming, but ensures a full and secure close every time. This product is designed to match the any other Fire Magic Echelon product. Cut Out Width 14 1/2"
14 1/2" 37 5/8" 31 5/8" 38"
21" 19" 19" 19 3/8"